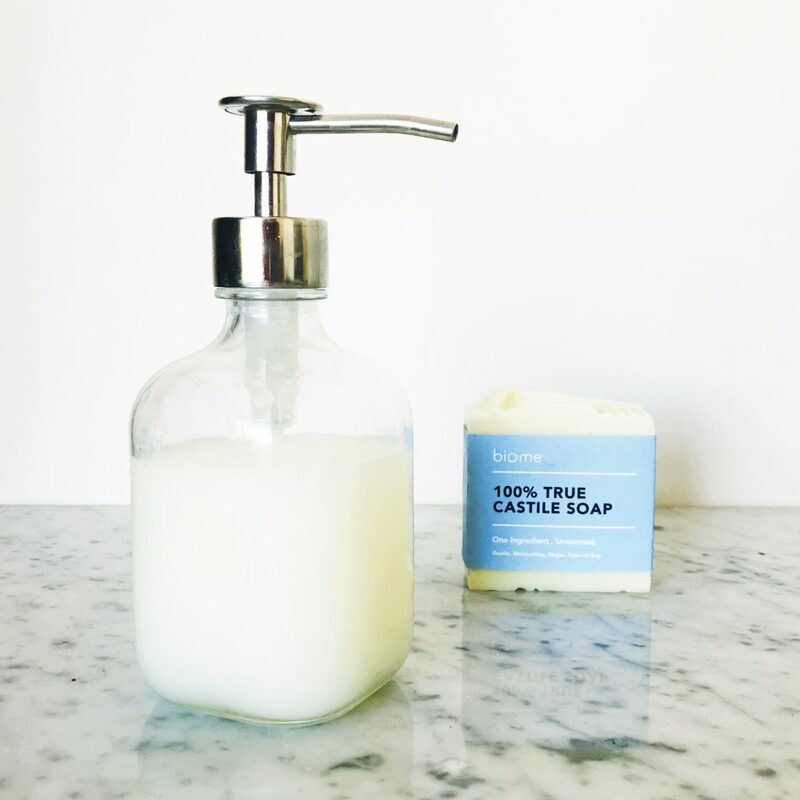 Our DIY liquid soap is a really easy recipe which combines Biome’s pure castile bar soap, your favourite carrier oil, essential oils and distilled water. Use this recipe to wash hands, your face, body or hair. You can also use it with Biome’s 3-in-1 Face Clay to make your own facial cleanser. This recipe is free from petrochemicals, synthetic ingredients, preservatives and palm oil. 12 drops of your favourite essential oils (here we used 4 drops each of rosemary, lavender and thyme). Add the soap flakes and the herb infused oil into a small saucepan with about ¾ cup of the water. Turn heat to low. Stir until the soap flakes start to dissolve into the water. This process may take some time. Add a little more water until you achieve the desired consistency. Handmade soap bars can differ in size so you may not need to use up all the water. Scoop off any foamy bubbles that start to form on the top. Once the soap flakes have fully dissolved, remove from the heat and add the essential oils if using. Let cool slightly. The mixture may thicken slightly but still remain a liquid. If it doesn’t, return to the heat and add a dash more water and stir. If it’s too liquid, add some more grated soap. Once cooled, pour your liquid soap into a soap dispenser. Use like any other liquid soap. Keep out of direct sunlight and use within 3-4 weeks. As this liquid soap recipe contains water, the use by date is relatively short. This recipe makes approximately 250ml. For best results we recommend using a natural handmade soap bar rather than a soap that contains petrochemicals and synthetic ingredients. The Biome 100% true castile soap is the best option. Infuse your fresh, clean and dry herbs in about 500ml of your favourite carrier oil. Then you can use what you need for this recipe and keep the remainder infusing until needed later. This recipe, though changed slightly, was adapted from 101 Easy Home Products by Jan Berry. If you have severe acne, very sensitive skin, or another skin concern or health condition, we recommend seeking medical advice before using any new product on your skin, whether that be a raw ingredient, a DIY product you’ve made yourself, or commercially formulated product.